August 15th & September 26th – Lighthouse, Maritime History & Gardiner’s Island Cruise. Learn the history of the area including that of Plum Island and Gardiner’s Island. 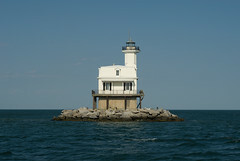 Participants will see five lighthouses which include Orient Point, Plum Island, Little Gull Island, Race Rock, and Long Beach Bar lighthouses. Maritime and lighthouse history narration is included. September 5th – Visit to Long Beach Bar “Bug” Lighthouse. This is a unique opportunity to visit and tour the totally replicated 1870 lighthouse which took only 60 days to complete. Climb into the lantern room of this working lighthouse and walk along the exterior walkway and get a true feel for this lighthouse. Narration will be included with this tour. All cruises depart at 3:30 P.M. and include a buffet dinner and Long Island wines. Fee is $95.00 per person. Reservations can be made in advance at East End Lighthouses or call 631-406-6180. Do you offer any Lighthouse tours the month of July. Please advise. Thanks.